MultiTranse European uses internet connection to get the online translation for a given text. It can translate into and from 22 European languages, including English, Russian, Spanish, Italian, Greek, German, French, Dutch, Bulgarian, Czech, Danish, Finnish, Latvian, Lithuanian, Norwegian, Polish, Romanian, Serbian, Slovakian, Swedish and Ukrainian. The program uses free Web resources to get the online translation, downloads needed fonts, has a multilanguage interface and supports full Unicode. With MultiTranse European, you'll be able to communicate in many languages. 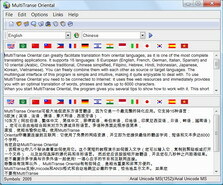 MultiTranse Oriental can greatly facilitate translation from oriental languages, as it is one of the most complete translating applications. It uses free online resources and provides you with a suitable online translation of words, phrases and texts up to 6000 characters. It is supports 14 languages including Arabic, Chinese, Hebrew, Hindi, Indonesian, Filipino, Japanese, Korean, Vietnamese, English, French, German, Italian and Spanish.